Our company announced support for our product on SQL Server 2012 recently. I answered a few questions about what that means for developers exactly. Looked at db statistics from the previous day. Decided to follow up on an un-patched database that was hogging the resources on its server. There was a bit of stress here. I have responsibility for something that I don’t have enough control over and I had to sort that out. I launched some tests earlier this week. These tests exercise a utility I wrote that deletes data. Because the tests last a few days, I checked up on their progress to see whether they’re still running (They are). Had a conversation with colleague about implementing a locking mechanism (similar to mutexes) at the database level. Tuning a two line query (which used a view in a view in a view) which is more like an 80 line query. Did I tell you I dislike views? They mask complexity and stuff like this happens. Just now I wrote a quick and dirty program to help me expand view definitions inline. I couldn’t quickly find a free utility online. It’s a cool simple program that I would share if I hadn’t written it during work hours. Woohoo! My first interruption of the day. There’s a particular third party app we use that doesn’t have a client timeout setting. Long running queries cause impatient users to hit refresh and now there’s two long running queries, then three, then four… With the help of sp_whoiscactive, we went from panic to understanding everything relevant. And the brought the server from unresponsive to responsive. The whole process lasted less than two minutes (Thanks again to Adam Machanic and his sp_whoisactive sproc!). Now I have to spend some extra time following up on this. I’ll probably take the next 15 minutes working with the issue tracking software we use to log this incident and make it possible for follow up activities. Interruption 2! A mercifully short question: No you can’t restore a 2008 R2 backup onto a 2008 server. Went to a used book to pick up Drawing on the Right Side of the Brain. My blog readers voted for Developing on the Right Side of the Brain to be my next post (published last week here) and I don’t have a well-thought-out idea for what the post should be about. The book should evoke some ideas. We’ll see how it goes. More time looking at the poor performing queries I mentioned earlier. Finally got to the bottom of it but with no easy fixes, it was time to discuss other options. I had a meeting about that. Some hard choices here. Not fun. Let’s move on. Started on a new project just now. I have to create a utility that takes a database and makes everything anonymous (no personally identifiable information). Easier said than done I think! Woohoo! Another interruption. And another interesting discussion about shrinking databases! Pasting this OneNote doc into wordpress to be edited later. Overall this was an average day I think. All this goes to say that there’s a lot of variety in this day in my job. And overall, I think that this day was pretty typical for myself. There was some overlap into DBA territory (production issues) and there was some overlap into Business Intelligence territory too. About 60% of my day was spent on activities I had planned in advance which and 40% then on surprises. 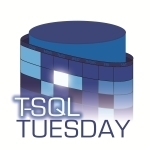 I’m really keen to see what the rest of the SQL Server bloggers did this day! Thanks Erin for hosting and the great topic. I’ve just come across your blog thanks to seeing that you’re presenting at the TorPASS group September fourth and I’m glad I did! For one, I’m thrilled to find out that there is an MS SQL MVP in KW! Who knew?! Second, I’m also happily surprised at how similar our days are and how closely our thoughts on views and “responsibility for something I don’t have enough control over” are. Hopefully we’ll bump into one another some time at a PASS meeting or something. P.S. The inline view expanding code – is that an SSMS plugin you wrote, or something else? 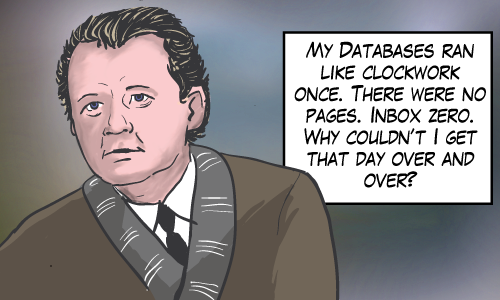 The SQL MVP is a relatively new thing for me (Jan 2012). The view expanding code was a windows forms application. The extra effort to learn how to make a SSMS plugin is probably not worth the slightly more convenient interface. 🙂 Maybe I’ll start an open-source project the next time I’m feeling ambitious.